A powerful, rugged rack setup ready for your gear. 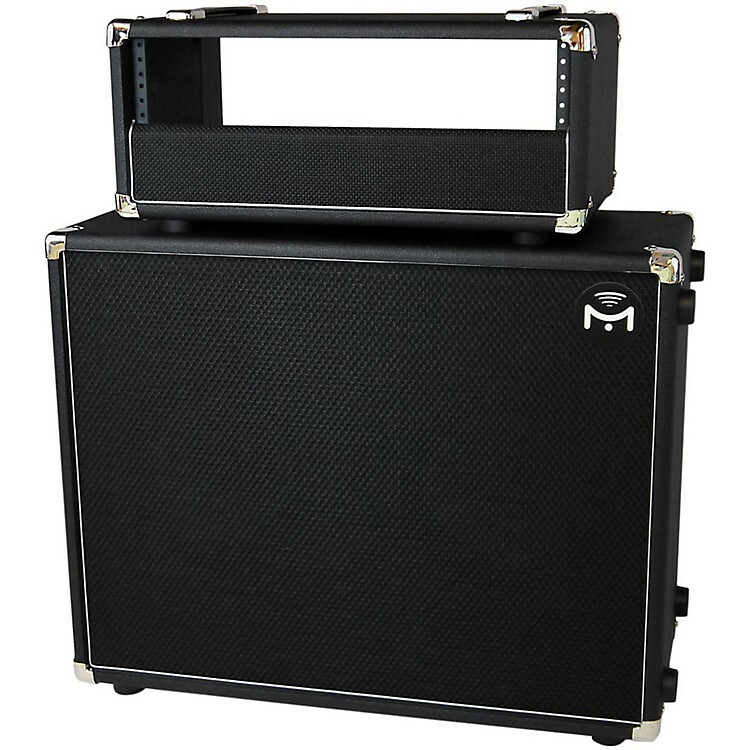 Gemini 2 is a 2x12³ full-range digital amplified speaker cabinet with integrated studio-quality USB audio interface for use with modelers and software-based guitar systems. Mission EmPower Technology features multi-channel class D power amplifiers, active crossovers with variable EQ, and full range co-axial drivers, all designed from the ground up to work together as the perfect amplification solution for modeling systems. Gemini 2 features a 2x110W internal amplifiers, 2—12³ low-frequency drivers, with 1³ coaxial high-frequency drivers providing a stereo solution in a single cabinet. Gemini 2 works perfectly with guitar processors with stereo outputs. Get the best out of ping pong delays, and swirling rotary speaker emulations. Create dual path patches assigning different cab sims to the different physical drivers. Blend clean and dirty signal chains to get you ultimate tone. Pro-audio 1/4" jack and XLR connectors, high-speed USB, and optional Class 2 stereo Bluetooth wireless interfaces connect Gemini amps directly with software-based guitar systems on computers, tablets and smartphones, as well as dedicated guitar processors. EmPower EQ control allows blending between a flat or a more traditional guitar cab frequency response. A switchable stereo output allows you to connect two Gemini units together. The studio-quality onboard digital audio interface features bit perfect class 2 stereo audio with, selectable sampling rates up to 192KHz and 24bit. This allows you to play and record directly into your PC or Mac without any additional hardware. Gemini's sophisticated power system provides a number of benefits not found in traditional guitar amplifiers. The integrated 100-240 input voltage and 50/60Hz compatibility means you can use Gemini almost anywhere in the world without requiring heavy and expensive transformers. Just connect directly to wall power wherever you are with a suitable cable. Power-saving features, such as a high-efficiency power supply and deep sleep modes for internal components, mean Mission Gemini's use a fraction of the power of a regular amp, costing less to run and wasting less energy. The included V-Lock power cable ensures the power is correctly connected, and protects against the cable being accidentally pulled out. The Gemini 2 will grace any stage or studio. Each cabinet is handmade from 3/4³ void-free, Baltic birch with a high-quality black Tolex covering, black basket weave acoustic speaker covering and chrome hardware. Guitarists using rack-mount guitar processors such as the Fractal Audio-Axe-FX, Avid Eleven Rack or Pod HD PRO can use the Gemini H, 19³ rack head and build the perfect modeling half stack. The Gemini 2 comes with sturdy rubber feet on both the base, and one side and can be used with the speakers in side-by-side mode for normal stereo, or vertical mode for PA style use. Mission EmPower active crossover with variable EQ.